The BMC Racing Team has announced the signature of both Dominik Nerz and Daniel Oss for the 2013 season. Both riders are currently at Liquigas-Cannondale and are the fourth an fifth riders confirmed to be leaving the green and blue team at the end of the season. It has already been confirmed that Tour de France third place Vincenzo Nibali will quit the Italian team, and will take teammates Valerio Agnoli and Alessandro Vanotti with him to Astana. Liquigas is due to end its eight-year partnership with the team at the end of the season and, although US bike company Cannondale remains committed as a sponsor, there is currently uncertainty over its future. "Daniel is qualified to ride all of the early-season classic races and any of the Grand Tours," said BMC Racing’s president and general manager John Ochowicz. "Dominik is more of a climber and will be equally as productive for the team in some of the Ardennes Classics, as well as the Grand Tours. We're happy to have them joining us for 2013." Nerz has spent most of his two years at Liquigas-Cannondale in the service of others, and was an integral part of Nibali’s Tour de France campaign this year. His biggest result of this season so far has been second place in the Rund um den Finanzplatz Eschborn-Frankfurt, behind teammate Moreno Moser. "I'm so happy about this because I think the BMC Racing Team is the best team of the world," said the German. "So for me it's perfect. 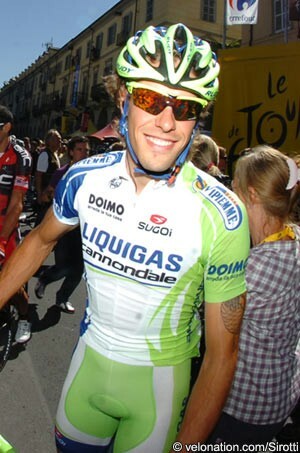 I hope that I can do one of the Grand Tours next year." Oss meanwhile has also ridden much of the last two seasons in the service of Slovakian champion Peter Sagan, and - along with Nerz - was instrumental in the 22-year-old’s green jersey victory in the Tour. He has taken some big results when able to ride for himself however, including victory in the sixth stage of last year’s USA Pro Cycling Challenge in Colorado, and ninth place - behind Nibali in third and Sagan in fourth - in this year’s Milano-Sanremo.